If it is possible to have hindsight twice and at the same time then Greeks Bearing Gifts is a book that exemplifies the occurrence. It is difficult to think that Philip Kerr had not given way to using Bernie Gunther as a mouthpiece for his own views about European relations, but he did have the advantage of using three periods of our history to do so. 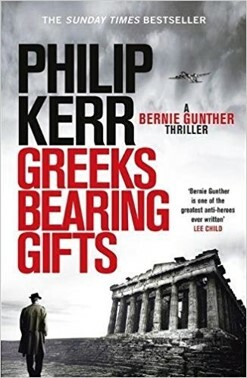 Greeks Bearing Gifts starts in 1957, where Gunther has had to go back to being a minion – a porter in a Munich mortuary – before someone recognises him as a former police officer and finds him something more appropriate to his talents (a claims investigator for an insurance company). In the evenings, Gunther finds himself as a ‘heavy’ (for protection) during an unusual handover of a suitcase loaded with illicit dosh. Between attempts to keep the body count down; as the cash handover goes wrong and his first investigation of a widow’s claim on her late husband’s life insurance commences and in so doing, Bernie starts to meet old friends and enemies. Having saved the company many Deutsch-marks on the insurance fraud he is happy to be sent to Greece to investigate the loss of a Jacques Cousteau-like diving vessel. With one difference: Cousteau was a hero of the French resistance, this Herr Witzel is a German with a background in both Kriegsmarine and Italian forces. Witzel also carries a gun under his arm – a little unusual even in Athens. Greeks Bearing Gifts is all about money – some of it real, much of it in gold bullion, some of it in potential loans and international trading – and nearly all of it used for improper negotiations. In 1943 the Germans were very keen to get the gold out of Greece, and as Salonika had a thriving Jewish business community there was a lot there. In 1945 there was not. In Bernie’s 1957 the Greek government wants to improve its relationship with West Germany and wants to join the new European Economic Community: the money has disappeared, and reparations are slow in coming. Never assume that ‘pragmatic’ means ‘tolerating corruption’ but the Greek government, according to Bernie, is being very pragmatic. He has come upon an un-corrupted Greek police officer who is still unhappy about the murders he had to tolerate during the war, but what can the two of them do? Meanwhile, what was on or under the sunken boat that caused Bernie to be sent to Athens in the first place? A few gold bars would not rust under the ground, they would not rust under the sea either, which would be reassuring if one could come back and collect them. A lot for the German government, a little for its servant, and an enormous hole for whoever had been the original victim of the crime, such as the Jews of Salonika. Bernie’s observations on the European news in the 1957 papers, Philip Kerr’s usual historic notes at the end of the book, and his readers’ own knowledge of events in Greece since 2000: Philip Kerr brought them all together, like the plots he has woven for his detective. He died young, in March this year, so he missed the latest euro-bond palaver over the make-up of the new Italian government, but reading Greeks Bearing Gifts against that background made it even more affecting. His publishers have one last novel in hand with the prospective title, Metropolis.